Battle for Angola delves still further into the troubled history of this former Portuguese African colony. 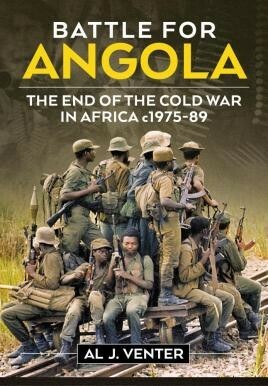 Following the publication of Al Venter's successful Portugal's Guerrilla Wars in Africa - shortlisted by the New York Military Affairs Symposium's Arthur Goodzeit Book Award for 2013 - in his Battle for Angola, he delves still further into the troubled history of this former Portuguese African colony. For the sake of continuity, the author has included several chapters on that colonial struggle in this work, with the main thrust on events before and after - including the civil war that followed Lisbon's over-hasty departure back to the metrópole, as well as the role of South African mercenaries in defeating the rebel leader Dr Jonas Savimbi (considered by some as the most accomplished guerrilla leader to emerge in Africa in the past century). He is helped by several notable authorities, including the French historian Dr René Pélissier and the American academic and former naval aviator Dr John (Jack) Cann. With their assistance, he covers several ancillary uprisings and invasions, including the Herero revolt of the early 20th century; the equally-troubled Ovambo insurrection, as well as the invasion of Angola by the Imperial German Army in the First World War. An important section deals with the South African Border War, because without Angola, that would never have happened - nor 'Operation Savannah' and the invasion of Angola from the south. Finally, the role of the Cuban Revolutionary Army receives the attention it deserves.